Apple today announced financial results for the third fiscal quarter of 2017, which corresponds to the second calendar quarter of the year. For the quarter, Apple posted revenue of $45.4 billion and net quarterly profit of $8.7 billion, or $1.67 per diluted share, compared to revenue of $42.4 billion and net quarterly profit of $7.8 billion, or $1.42 per diluted share, in the year-ago quarter. Gross margin for the quarter was 38.5 percent compared to 38 percent in the year-ago quarter, with international sales accounting for 61 percent of revenue. Apple also declared a quarterly dividend payment of $0.63 per share, payable on August 17 to shareholders of record as of August 14. Apple sold 41 million iPhones during the quarter, up slightly from 40.4 million a year earlier, while Mac sales rose slightly to 4.29 million units from 4.25 million units in the year-ago quarter following the introduction of a number of updated Macs in June. iPad sales saw a significant increase on the strength of new iPad Pro models released late in the quarter and a low-cost iPad earlier in the year, rising to 11.42 million from 9.95 million. iPad unit sales were up 28 percent compared to the previous quarter and 15 percent year-over-year. Apple's guidance for the fourth quarter of fiscal 2017 includes expected revenue of $49–52 billion and gross margin between 37.5 and 38 percent. Apple will provide live streaming of its fiscal Q3 2017 financial results conference call at 2:00 PM Pacific, and MacRumors will update this story with coverage of the conference call highlights. A complete transcript of the conference call with Apple CEO Tim Cook and CFO Luca Maestri, including questions and answers, is available ahead. Good afternoon, and thanks everyone for joining us. Today, we're proud to announce very strong results for our fiscal third quarter, with unit and revenue growth in all of our product categories. We'll review our financial performance in detail, and I'd also like to talk about some of the major announcements we made in June at our Worldwide Developers Conference. It was our biggest and best WWDC ever, and the advancements we introduced across hardware, software, and services will help us delight our customers, and extend our competitive lead this fall, and well into the future. For the quarter, total revenue was at the high end of our guidance range at $45.4 billion. That's an increase of 7 percent over last year, so our growth rate has accelerated in three consecutive quarters this fiscal year. Gross margin was also at the high end of our guidance, and we generated a 17 percent increase in earnings per share. iPhone results were impressive, with especially strong demand at the high end of our lineup. iPhone 7 was our most popular iPhone, and sales of iPhone 7 Plus were up dramatically compared to 6s Plus in the June quarter of last year. The combined iPhone 7 and 7 Plus family was up strong double digits year over year. One decade after the initial iPhone launch, we have now passed 1.2 billion cumulative iPhones sold. Services revenue hit an all-time quarterly record of $7.3 billion, representing 22 percent growth over last year. We continue to see great performance all around the world, with double-digit growth in each of our geographic segments. Over the last 12 months, our services business has become the size of a Fortune 100 company, a milestone we've reached even sooner than we had expected. We had very positive results for iPad, with broad-base growth in units, revenue, and market share. iPad sales were up 15 percent year over year, and grew across all of our geographic segments. We achieved our highest global market share in over four years, based on IDC's latest estimate of tablet market results for the June quarter. And in markets like China and Japan, over half of iPads were sold to people buying their very first iPad. Our iPad product lineup is stronger than ever. The new iPad we launched in March offers great value and performance, and the all-new 10.5-inch iPad Pro launched in June features the world's most advanced display with ProMotion technology, and is more powerful than most PC desktops. iPad is the perfect tool for teaching in new and compelling ways, and our iPad results were especially strong in the U.S. education market, where sales were up 32 percent year over year to over 1 million units. We believe coding is an essential skill that all students should learn. We're thrilled that over 1.2 million students of all ages are now using iPad and Swift Playgrounds to learn the fundamentals of coding, and over 1,000 K-12 schools across the United States plan to use Apple's "Everyone Can Code" in their curricula this fall. And for high school and community college students who want to pursue careers in the fast-growing app economy, we announced "App Development with Swift," an innovative full-year curriculum designed by Apple engineers and educators, and provided free to schools to teach students to code and design fully functional apps, gaining critical job skills in software development and information technology. I'd like to turn now to Mac, which gained global unit market share and reached new June quarter unit sales records in mainland China and Japan. Mac revenue grew 7 percent year over year, driven by the strength of the MacBook Pro and iMac, despite IDC's latest estimate of a 4 percent unit contraction in the global PC market. And with the refresh of almost our entire Mac lineup in June, we're off to a great start for the busy back to school season. Sales of Apple Watch were up over 50 percent in the June quarter, and it's the number one selling smartwatch in the world by a very wide margin. Apple Watch is having a positive impact on peoples' health and daily lives, and motivating them to sit less and move more. With features like built-in GPS and waterproofing, Apple Watch Series 2 is the perfect companion for hiking, running, and swimming. We're also seeing incredible enthusiasm for AirPods, with 98% customer satisfaction based on a Creative Strategies survey. We have increased production capacity for AirPods, and are working very hard to get them to customers as quickly as we can, but we are still not able to meet the strong level of demand. We made some big announcements during the June quarter that I'd like to quickly review. We launched a new investment in the future, through our advanced manufacturing fund. We've earmarked at least $1 billion for this program, aimed at helping our manufacturing partners develop innovative production capabilities, and create high-skilled jobs in the United States. We believe this can lay the foundation for a new era of technology-driven manufacturing in the US. The first $200 million from the fund has been committed to Corning, to support R&D, capital equipment needs, and state-of-the-art glass processing. As we announced at WWDC, we have a very exciting fall ahead, with stunning advances in iOS 11, macOS High Sierra, and watchOS 4. iOS 11 will make iPhone better than ever, with Apple Pay peer-to-peer payments, an even more intelligent and natural Siri, new expressive Messages with full-screen effects, richer and more powerful Maps, enhanced Live Photos, Memories, and Portrait Mode effects, and much, much more. iOS 11 will also take the iPad experience to a whole new level, with features such as a customizable Dock, Multi-Touch drag and drop, powerful new multitasking, more efficient QuickType, and great new Markup and scanning abilities. One of the most exciting and most promising announcements from WWDC was ARKit, a new set of tools for developers to create augmented reality apps. It's still early in the beta period, but it's clear that ARKit has captured the imagination of our developer community. We think ARKit will help the most creative minds in the industry tap into the latest computer vision technologies to build engaging content. We believe AR has broad mainstream applicability, across education, entertainment, interactive gaming, enterprise, and categories we probably haven't even thought of. With hundreds of millions of people actively using iPhone and iPad today, iOS will become the world's biggest augmented reality platform as soon as iOS 11 ships. With iOS 11, we're also bringing the power of machine learning to all Apple developers with CoreML, enabling capabilities like face detection, object tracking, and natural language interpretation. CoreML lets developers incorporate machine learning technologies into their apps, with all the processing done right on device, so it respects our customers' data and privacy. For Mac, we provided a peek at the immersive gaming, 3D, and virtual reality experiences made possible with the upcoming release of macOS High Sierra, and the amazingly powerful iMac Pro. We're proud to make the best personal computers in the industry, and we're excited to deliver even more innovation in the months to come. Apple Watch will become more intelligent than ever this fall with watchOS 4, featuring a proactive Siri watch face, personalized Activity coaching, and an entirely new Music experience. watchOS 4 also introduces GymKit, a groundbreaking technology platform to connect workouts with cardio equipment. We also previewed HomePod, a breakthrough wireless speaker for the home that delivers amazing audio quality and uses spatial awareness to sense its location in the room and adjust its audio automatically. Visitors to our listening room at WWDC were blown away by the HomePod's incredible sound, which is unlike any other wireless home speaker on the market. With deep knowledge of music, HomePod is designed to work with your Apple Music subscription to help you enjoy the music you already love, and as well discover great new music based on your personal preferences. As an intelligent home assistant, HomePod is a great way to send messages, set a timer, get updates on news, sports, and weather, or control smart home devices by simply asking Siri to turn on the lights, close the shades, or activate a scene. We can't wait to deliver all of these powerful new innovations in the months to come, and we might even have some others to share with you later in the year. Revenue for the June quarter was $45.4 billion, up 7 percent over last year, an acceleration to the growth rate we reported in the first half of our fiscal year. We achieved these results despite a 200 basis point negative impact from foreign exchange on a year-over-year basis, as currency movements, especially in Europe and China, affected our reported results. Our performance was very strong across the board, with growth in all of product categories, and almost every market around the world. We achieved double-digit growth in many developed markets, including the US, Canada, Germany, Spain, Australia, and Korea. And emerging markets outside of Greater China grew 19 percent over a year ago. Gross margin was 38.5 percent, at the high end of our guidance range. Operating margin was 23.7 percent of revenue, and net income was $8.7 billion. Diluted earnings per share were $1.67, up 17 percent over last year. Cash flow from operations was $8.4 billion. During the quarter we sold 41 million iPhones, and reduced iPhone channel inventory by 3.3 million units, leaving us with our lowest level of channel inventory in 2.5 years, and well within our 5-7 week target inventory range. iPhone sales were up year over year in most markets we track, with many markets in Asia, Latin America, and the Middle East growing unit sales by more than 25 percent. We are very pleased with these iPhone results, especially considering the tough comparison to the June quarter last year, when we launched iPhone SE. iPhone ASP was $606, up from $595 a year ago, thanks to strong demand for iPhone 7 Plus, which represented a higher percentage of the iPhone mix compared to the Plus model a year ago. The impact of the stronger mix on ASP was partially offset by negative foreign exchange year over year and the reduction in channel inventory, which took place entirely at the high end of the portfolio. 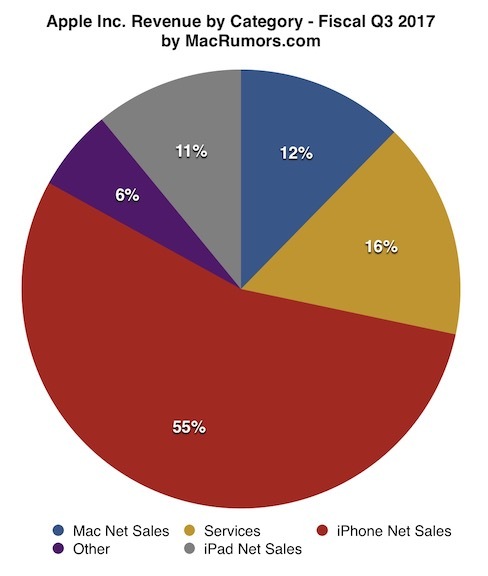 Customer interest and satisfaction with iPhone are very strong, with both consumers and business users. In the US, the latest data from 451 Research for consumers indicates a 95 percent customer satisfaction rating for iPhone 7, and 99 percent for iPhone 7 Plus. Among consumers planning to buy a smartphone, purchase intention for iPhone was nearly three times the rate of our closest competitor. Among corporate smartphone buyers, iOS customer satisfaction was 94 percent, and of those planning to purchase smartphones in the September quarter, 78 percent plan to purchase an iPhone. Turning to services, we set an all-time quarterly record of $7.3 billion, up 22 percent year over year. The App Store was a major driver of this performance, and according to App Annie's latest report, it continues to be by a wide margin the preferred destination for customer purchases, generating nearly twice the revenue of Google Play. Revenue from our Apple Music streaming service and iCloud storage also grew very strongly, and across all of our services offerings, the number of paid subscriptions reached over 185 million, an increase of almost 20 million in the last 90 days alone. The reach, usage, and functionality of Apple Pay continued to grow. We launched Apple Pay in Italy in May, and the UAE, Denmark, Finland, and Sweden are scheduled to go live before the end of this calendar year. Apple Pay is by far the number one NFC payment service on mobile devices, with nearly 90 percent of all transactions globally. Momentum is strongest in international markets, where the infrastructure for mobile payments has developed faster than in the US. In fact, three out of four Apple Pay transactions happen outside of the US. With the launch of iOS 11 in the fall, our users in the US will be able to make and receive person-to-person payments quickly, easily, and securely. Next, I'd like to talk about the Mac. Thanks to great performance from the new MacBook Pro, we generated 7 percent revenue growth over last year, and gained share in the global PC market, based on the latest data from IDC. Customer satisfaction for Mac is very strong at 97 percent, in the most recent survey from 451 Research, and our active installed base of Macs has grown double digits over a year ago. We entered the quarter within our four- to five-week target range for Mac channel inventory, and we have a great lineup of Macs for our customers heading into the busy back to school season. Turning to iPad, we sold 11.4 million units, up 15 percent over last year. We were happy to see iPad growth in each of our geographical segments, with strong double digit increases in key markets, such as the US, Japan, Germany, France, and Greater China. We exited the quarter within our five- to seven-week target range for iPad channel inventory. NPD indicates that iPad had 55 percent share of the US tablet market in the month of June, including eight of the 10 best-selling tablets. That's up from 46 percent share a year ago, and among tablets priced over $200, iPad share was 89 percent. In addition, the most recent survey from 451 Research measured business and consumer satisfaction rates ranging from 95 to 99 percent across iPad models. And among those planning to buy tablets, purchase intent for iPad was over 70 percent. Our enterprise business continues to expand, and our customers are transforming the way work gets done with iOS and iPad. Walmart will be deploying more than 19,000 iPads for employee training across 50 states, with projections of over 225,000 associates trained on iPad by the end of the year. The initial response from businesses to iOS 11 and the new iPad Pro has been amazing, and companies including Bank of America, Medtronic, and Panera Bread tell us that they will be rolling out the 10.5-inch iPad Pro throughout key areas of their organizations. We're also seeing real traction with our enterprise partners. Just last month, we unveiled the next set of technology announcements in our partnership with Cisco. This new wave adds a whole new category of security features designed to help enterprises and employees defend against growing cyber threats. We believe this investment in our joint security solutions for iOS will make cyber insurance even more attainable for businesses. SAP is making great strides since launching the SAP Cloud Platform SDK for iOS in March, with a pipeline of hundreds of global opportunities. SAP has also released Success Factors Mobile, its first native iOS app for human resources, which will support 47 million iPhone and iPad users worldwide across multiple industries. Our partnership with Deloitte has recently expanded to seven more European countries. We're helping clients transform their businesses with iOS. We jointly develop programs, such as the Connected Store, a pop-up version of a retail environment demonstrating iOS tools for sales and demand generation, as well as tailored apps for sales associates, store management, and customers. We also had a tremendous quarter for iPad in education, up 32 percent year over year, following the launch of our new iPad in March, an update to our popular Classroom app, and continued enhancements to iOS that make managing iPads in the classroom even easier. The Saint Paul Public Schools in Minnesota is renewing its one-to-one program by deploying over 40,000 iPads across every student and teacher in the district. iPad was chosen because of its power and durability, ease of use, multimedia and accessibility features, and the extensive catalog of iOS apps designed specifically for education. The Shawnee Mission School District outside Kansas City recently purchased 19,000 iPads, extending its one-to-one program started in 2014, thanks to iPad's intuitive interface, superior reliability, and expansive ecosystem of iOS tools for education. It was a very busy quarter for our online and retail stores, which collectively welcomed over 300 million visitors. In addition to our spectacular new store at the Dubai Mall, we opened our first stores in Singapore and in Taiwan during the quarter, expanding our total store footprint to 497 stores. In May, we kicked off Today at Apple, with new in-store programming from music to photography to art and coding, and our stores collectively hosted 87,000 sessions during the quarter. As Tim mentioned last quarter, we have entered a new chapter in retail, with unique and rewarding experiences for our customers, and some stunning new stores coming in the near future. Let me now turn to our cash position. We ended the quarter with $261.5 billion in cash plus marketable securities, a sequential increase of $4.7 billion. $246 billion of this cash, 94 percent of the total, was outside the United States. We retired $3.5 billion of debt, and issued the equivalent of $10.8 billion in new euro and US dollar denominated debt during the quarter, including our second green bond, bringing us to $96.4 billion in term debt, and $12 billion in commercial paper outstanding. We also returned $11.7 billion to investors during the quarter. We paid $3.4 billion in dividends and equivalents, and spent $4.5 billion on repurchases of 30.4 million Apple shares through open market transactions. We launched a new $3 billion accelerated share repurchase (ASR) program, resulting in initial delivery and retirement of 15.6 million shares, and we retired 3.4 million shares upon completion of our tenth ASR during the quarter. We have now completed $222.9 billion of our $300 billion capital return program, including $158.5 billion in share repurchases. As we move ahead into the September quarter, I'd like to review our outlook, which includes the types of forward-looking information referred to at the beginning of the call. We expect revenue to be between $49 billion and $52 billion. We expect gross margin to be between 37.5 percent and 38 percent. We expect operating expenses to be between $6.7 billion and $6.8 billion. We expect other income/expense to be about $500 million, and we expect the tax rate to be about 25.5 percent. Also today, our Board of Directors has declared a cash dividend of 63 cents per share of common stock, payable on August 17, 2017 to shareholder of records as of August 14, 2017. With that, I would like to open the call to questions. Katy Huberty, Morgan Stanley: Yes, thanks, good afternoon. Luca, first question for you. Gross margin guidance is strong, but it did tick down from your June quarter guidance, and you also narrowed the range to 50 basis points, so I wondered if you could just address what is the driver of this sequential downtick, and what gives you confidence that you have more visibility than you did three months ago? Maestri: Katy, sequentially from 38.5 percent that we just reported, typically we have product transition costs during the September quarter — that's the primary driver, this happens fairly regularly for us. We also have a more difficult memory pricing environment this year than a year ago, and we think that we're going to be able to partially offset this with a positive leverage. As you've seen, we've guided up sequentially in revenue. So, those are the major puts and takes. In terms of the range that we use for gross margins, we have a fairly good understanding on where we are with our hedging program, and that allows us to mitigate some of the volatility there, so we felt that we could guide to a slightly narrow range, which we've done occasionally in the past. Huberty: Maybe a question for both Tim and Luca. As you outlined on this call, and at the developer conference in June, there is an unprecedented number of products that either ramp to volume or launch in the back half of this year, so appreciating you only formally guide a quarter out, I wonder if there's any qualitative commentary you can provide to help us think about the back half of this calendar year and how all those new products that come into the model could impact either revenue seasonality versus past years, or could impact just the cost associated with ramping that many products all at once? Cook: Katie, as Luca mentioned, we did assume some transitional costs in our guidance for the quarter — as is typically the case. We're looking very much forward to the product rollouts. Shannon Cross, Cross Research: Tim, could you talk a bit about what you're seeing in China? You know, I think, obviously, there continues to be strong demand for smartphones that perhaps mix shift. I think you brought back the iPhone 6 this quarter to be a bit more price aggressive. And then, can you just talk a bit about how you see that market developing with the growth of WeChat and some of the other developments that are happening there? Cook: We were very encouraged by the results this quarter. We improved as we thought we would from previous quarters — a little more than I thought we would. If you look underneath the numbers, mainland China was actually flat year over year, during Q3, and in constant currency, we were actually up 6 percent in mainland China. So, we're very encouraged by that. iPad grew dramatically more than the market. The Mac grew much more than the market. iPhone was relatively flat year on year — similar as the market was. And so we see all of those as very encouraging signs. On top of that, services grew extremely strongly during the quarter. Hong Kong continued to drag down the total Greater China segment but, on a sequential basis, we're probably sort of at the trough of that, which is nice. With a peg to the dollar there, and tourism being what it is, I don't really know when that market will come back, but what we see in the mainland is definitely much more encouraging. It's interesting to note that upgraders, both for the quarter and actually for the full fiscal year to date, was our highest ever — that we felt really good about. In terms of WeChat, the way I look at this is, because iOS share is not nearly a majority of the market in China, the fact that a lot of people use that — it makes the switching opportunity even greater. I think that's more the case than the risk that a lot of folks have pointed out. I see Tencent as one of our biggest and best developers. They've done a great job of implementing iOS features in their apps, and we're looking forward to working with then even more to build even greater experiences for our mutual users in China. Cross: Can you talk a bit about the composition of the installed base of iPhones at this point? Obviously, we're getting close to a refresh. You brought in the iPhone SE, you obviously have strength at the high end. I'm just trying to think about what percentage do you think have upgraded in the prior generation. Any color you can give us on that? Cook: From an absolute quantity point of view, the upgrades for this fiscal year are the highest that we've seen. We feel good about that. However, if you look at it from an upgrade rate point of view, instead of the absolute number, the rate is similar to what we saw with the previous smartphones, except for the iPhone 6, which as we've called out in the past, had an abnormally high upgrade rate. We do think that based on the amount of rumors, and the volume of them, that there's some pause in our current numbers. Where that affects us in the short term, even though we had great results, it probably bodes well later on. Steve Milunovich, UBS: I'm wondering if you wanted to make any comments about switching this quarter. Cook: Switching outside of China was up year on year, and so we're happy with that. We continue to see people moving over to iOS, and it helped with us making the results that Luca announced earlier, including the channel inventory reduction. Milunovich: OK, and then a government question. First of all, the President suggested that you may build three big beautiful plants. I wondered if you'd comment on if that's a possibility, either directly or indirectly. And then in China, I think we all understand that you have to work within the regulations, but maybe if you could comment on how your working relationship is with the government, and if there's certain lines that you can't cross. Cook: Starting with the US. Let me just take this question from a "what are we doing to increase jobs" — which I think is probably where it's rooted. We've created two million jobs in the US, and we're incredibly proud of that. We do view that we have a responsibility in the US to increase economic activity in the US, including increasing jobs, because Apple could only have been created here. So as we look at those two million, there are three main categories of that, and we have actions going on in each of them to further build on that momentum. The first category is app development — about three quarters of the 2 million are app developers — and we're doing an enormous amount of things to deliver curriculum to both K-12 with Swift Playgrounds and the K-6 area, other curriculum as you proceed above grade six under the Everyone Can Code area. And just a couple months ago, we announced a new curriculum that's focused on community colleges, junior colleges, and technical colleges for kids that did not have coding in their elementary and high school years. And so we're excited about that because we think it could increase the diversity of the developer community — and the quantity. And I think this area in general, and all of the things that we do for the developer community, will be the largest contribution that Apple can make, because this is the fastest growing job segment in the country, and I think will be for quite some time. If you look at the second area, we have purchased last year about $50 billion worth of goods and services from US-based suppliers — some significant portion of those are manufacturing related, and so we've asked ourselves what we can do to increase this. You may have seen, at the beginning of the quarter, we announced an advanced manufacturing fund, that we're initially placing $1 billion in, and we've already deployed $200 million of that. The first recipient is Corning in Kentucky, and they'll be using that money to expand the plant to make very innovative glass. We purchase that glass and essentially export it to the world with iPhones and iPads. We think there's more of these that we can do. I think there's probably several plants that can benefit from having some investment to grow or expand or even maybe set up shop in the US for the first time. So we're very excited about that. And then in the third area, we have about two-thirds of our total employee base in the US, despite only a third of our revenues being here, and so we some have things we'll say about that later in the year. And so that's what we're doing from a job growth point of view, and we're very, very proud of that. Now, turning to China, let me sort of comment on what I assume is at the root of your question about this VPN kind of issue. Let me just address that head on. The central government in China back in 2015 started tightening the regulations associated with VPN apps — and we have a number of those on our store. Essentially, as a requirement for someone to operate a VPN, they have to a have a license from the government there. Earlier this year, they began a renewed effort to enforce that policy, and we were required by the government to remove some of the VPN apps from the App Store that don't meet these new regulations. We understand that those same requirements are for other app stores, and as we checked through, that was the case. Today, there's still hundreds of VPN apps on the App Store, including hundreds by developers that are outside of China, so there continues to be VPN apps available. We would obviously rather not remove the apps, but like we do in other countries, we follow the law wherever we do business. We strongly believe that participating in markets and bringing benefits to customers is in the best interest of the folks there, and in other countries as well. We believe in engaging with governments, even when we disagree. In this particular case, back to commenting on this one, we hope that over time, the restrictions we're seeing will be loosened, because innovation requires freedom to collaborate and communicate, and I know that is a major focus there. That's sort of what we're seeing from that point of view. Some folks have tried to link it to the US situation last year — they're very different. In the case of the US, the law in the US supported us. It was very clear. In the case of China, the law is also very clear there, and like we would if the US changed the law here, we would have to abide by it in both cases. That doesn't mean we don't state our point of view, in the appropriate way — we always do that. Kulbinder Garcha, Credit Suisse: Question for Tim on the iPhone installed base. There are points in the past you've talked about the rate in which it was growing. At the end of the first half, what is that up year on year, what rate is it growing? And on upgrade rates over the longer term, there's lots of moving parts — and I get that there's I guess geographical mix of your base, and how carriers promote your products — but do you think this rate of upgrade is sustainable? Does it get faster over time? Cook: I think the upgrade rate is a function of many, many different things, from the size of the installed base, the age of the installed base, the product that is new at the time, the regional distribution, the upgrade plans that are in various markets around the world — and so I think there are many, many factors in that. It's not a simple thing that you can apply a set formula to or one variable, or a couple of variables, formula, to, in my opinion. But I think in general, because our installed base was up strong double digits once again, there's a lot of factors that are very positive for us. Between the upgraders and the switchers that we see, and still the first time buyer categories that's still out there too in several countries — including some in which you may not think there's still a sizable base in some — between those three areas, we think we have a lot of opportunity. Toni Sacconaghi, Bernstein: Typically, in the fiscal Q4, Apple builds considerable iPhone channel inventory — like 2 or 3 million units. You're starting from a very low point at the end of fiscal Q3 as you mentioned in the call, with the drawdown. As we think about what's in your guidance for fiscal Q4 for channel inventory for iPhone, should we be expecting a sort of normal seasonal build, or is it likely to be significantly higher given the very low starting point? Maestri: As you know, Toni, we don't guide on channel inventory — we've never done that. We're providing a fairly wide range from a revenue standpoint, so obviously that also has an impact on potential channel inventory levels. One thing that I will tell you is that we feel very good about the performance of the business right now. We think our services business will continue to grow well. We have a lot of momentum on iPad and Mac, because we refreshed the lineups of those products. Apple Watch and AirPods are doing incredibly well — we're getting a lot of positive customer feedback. And I think, in general, the performance in China, Tim has mentioned it, the performance will continue to improve. So, those are the drivers of our guidance range for the quarter. Sacconaghi: Tim, I was wondering if you could talk a little bit about two things that you've mentioned in public before. One is television, which you have described as an area of intense interest, but I don't even think there was an update on Apple TV on this call, so perhaps you can talk to us about how you're thinking about content. I know you're doing some original content creation, and how that area is evolving in your thinking. Recently, you talked about how Apple is focusing on autonomous systems for automobiles. There's been press reports that Apple has been testing autonomous vehicles for possibly up to a year. I was wondering if you could talk a little bit more about Apple's interests in autonomous vehicles and whether self driving is really likely to be Apple's principal focus in the near to medium term? Cook: On the first part of your question about original content, we have done some original content. It's focused on Apple Music. Currently, we have some more that is launching in a week or so, that will be made available on Apple Music. The objective of this is really twofold. One is for our own learning, given that we're new in the video space in terms of creation and, two, is to give our Apple Music subscribers some exclusive content and hopefully grow our subscriber base. We've recently hired two great folks with lots of experience in creating content, like Breaking Bad and The Crown, and some really top-notch content, so we'll see how this area goes. It is still an area of great interest. In terms of autonomous systems, what we've said it that we're very focused on autonomous systems from a core technology point of view. We do have a large project going, and we're making a big investment in this. From our point of view, autonomy is sort of the mother of all AI projects. Autonomous systems can be used in a variety of ways, and a vehicle is only one. There are many different areas of it. I don't want to go any further with that. Mike Olson, Piper Jaffray: This may be a hard question to answer in a condensed way, but how would you describe what you expect the most near-term applications will be for developers to target with ARKit? Will it be consumer iPhone and iPad applications, enterprise applications, or I guess some kind of combination of the two? Basically, how does this come to market in the most significant way in the next few quarters as Apple becomes the largest global platform for AR as you talked about? Cook: I could not be more excited about AR, and what we're seeing with ARKit in the early goings. To answer your question about what category it starts in, just take a look at what's already on the web in terms of what people are doing — and it's all over the place. From entertainment to gaming, I've seen what I would call more small business solutions, I've seen consumer solutions, I've seen enterprise solutions. I think AR is big and profound. This is one of those huge things that we'll look back at and marvel on the start of it. I think that customers are going to see it in a variety of ways. Enterprise takes a little longer sometimes to get going, but I can tell you there's a lot of excitement already in there. I think we'll start to see some applications there as well. It feels great to get this thing going at a level that can sort of get all the developers behind it. I couldn't be more excited about it. Amit Daryanani, RBC Capital Markets: On your services segment, your revenue actually accelerated by 200 basis points. What's driving this? Is there a way to think about average revenue per user (ARPU) in a traditional manner within that services business versus the installed base growing? Maestri: Our services business is very broad. We've got multiple categories in the services business. So, it's difficult to talk about ARPU in general, it doesn't make a lot of sense. The reason for the acceleration also here this month involves multiple factors. One of them is the App Store, which is the largest of our services categories, is seeing an increasingly larger amount of paying accounts. On a year over year basis, the number of accounts that are actually transacting and paying on the App Store is growing very, very well. It is happening for a variety of reasons. One of them, for example, is the fact that we're making it easier for customers to pay on the App Store. Outside the United States, in many markets, not every form of payment is accepted. We're making it easier all the time. We launched on Alipay, for example, during the December quarter. That has obviously helped a lot in the growth of the number of paying accounts. We continue to bring more and more forms of payment in the App Store around the world. The other reason why the number of paying accounts is growing is because the quality and the quantity of content continues to improve, and so there's many more ways of experiencing games and entertainment and other apps on the store. We have other businesses like the Apple Music streaming service, which is growing very fast. We just started it a few years ago, so we are getting a lot of new subscribers there. Our iCloud storage business continues to grow very, very fast. It's multiple services — the number of people transacting on our stores continues to grow. In terms of ARPU, and maybe I can make a comment on ARPU specifically related to the App Store, what we're seeing over a long period of time as we keep track of this cohort of customers, is that customers get on the App Store and start spending on it. We start seeing this spending profile that is very similar across generations of customers. People tend to spend more over time. Obviously, you have different spending profiles in different geographies around the world. But, in general, you see that trend across the board. Daryanani: On the iPhone side, there's been a large amount of discussion among blogs and component suppliers that the timing this time may be somewhat different and delayed versus the past. Your guidance almost seems like you're more excited about this iPhone launch versus historically, sequentially. Beyond the fact we probably shouldn't read every blog, and believe every blog, what do you think is different with this product launch or product availability compared to the cycle we're used to seeing historically? Cook: We have no comment on anything that's not announced. Brian White, Drexel Hamilton: Growth in the smartphone market is now crawling along at about a single-digit percentage — I know iPhone grew at about 2 percent year over year this quarter. It's looks like you had a bout a mid-teens market share in units in 2016. Looking forward three to four years, do you think Apple can expand its unit market share, and if so, what will the drivers by? And my second question is just general thoughts around India in the quarter? Cook: The answer to your first question is, yes, I do think we can grow in both units and market share. We don't predict those things. If you ask me what I think, that's what I think. What are the drivers? The installed base is growing — it's still growing very strongly — that will generate more upgrades over time. I feel good about our ability to convince people to switch. And where the developed markets, the first time buyer rates are down — other than places like Japan, perhaps — the emerging markets, we haven't even gotten started yet, really. From a revenue point of view, we had very strong growth there in emerging markets, excluding China, we're up like 18 percent. It was a record for us. So, we see a lot of opportunity in these markets. We are investing in India, as you mentioned in your second point. We already launched an App Accelerator Center. That's on top of working with the channel, and looking at expanding our go-to-market in general. And we began to produce the iPhone SE there during the quarter, and we're really happy with how that's going. And so we're bringing all of our energies to bear there. I see a lot of similarities to where China was several years ago. I'm very, very bullish and very, very optimistic about India. It's not "padding numbers". It's called selling a product that people want to buy. Nonsense. I bought the 10.5 iPP and love it. I got my mom the new iPad -- different use cases, different products, different sales. And yet MacRumors members claimed the new iPad was a dud and wouldn't sell. They claimed the new MacBook Pro was garbage and wouldn't sell. They claimed the lack of other new Macs meant Mac sales would be nothing. They claimed the iPhone 7 wouldn't sell because people were going to wait for the 8. And as always MacRumors members were completely wrong. 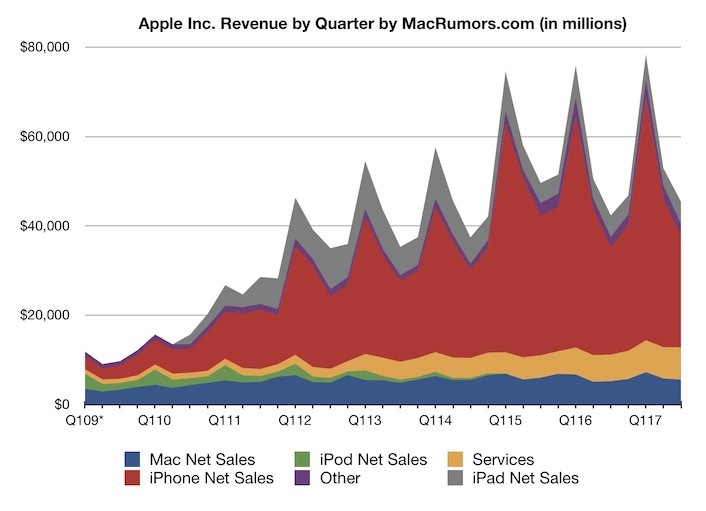 So happy to see iPad returning to growth not only quarter over quarter but year over year. These new models are fantastic and I'm using my 10.5" Pro all day every day. I would say that's doing pretty damn well! There's WAAAY too much APPL love in here. Something wrong with MR forums. So, they're not doomed after all? My 81 y.o. mother-in-law bought her first Apple computer recently, a 12.9" iPad Pro, and she's loving it. She'd been using PC's (very lightly), got tired of malware and general Windows friction, and is loving her new iPP. The new iPad Pro and MacBooks must be selling well.